Here’s a pair of LayerOne Badge hacks that actually included the RC as intended by the badge designers. First up, we have the autonomous RC car built by [Arko]. He calls it Stanley Jr. as an homage to the Stanford DARPA Grand Challenge vehicle. 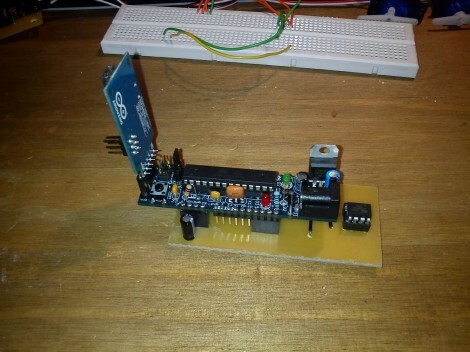 It uses an Arduino shield to add a servo with an ultrasonic rangefinder on it. The lets the vehicle drive a bit, stop and scan the horizon, then drive some more. The hope is the rangefinder will keep it from running into anything. There’s a quick test run embedded after the break. On the right is the badge hack which [Zjpahle] finished up after the contest was already over. He also chose to go with an Arduino shield, this time it’s an IMU board. 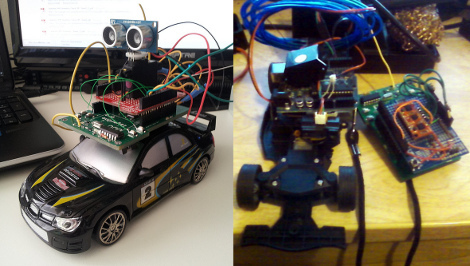 But he added a standalone Arduino board to the vehicle which drives some EL wire (ground effects) and adds IR sensors to the front of the car. The IR sensors are for obstacle avoidance, and the IMU lets him tilt his badge for direction control. We looked at the winner of the badge hacking competition on Wednesday. That hack didn’t involve the car, but used the badge as a Morse Code beacon. [John] is keeping the neighborhood safe by keeping an eye out for speeders. 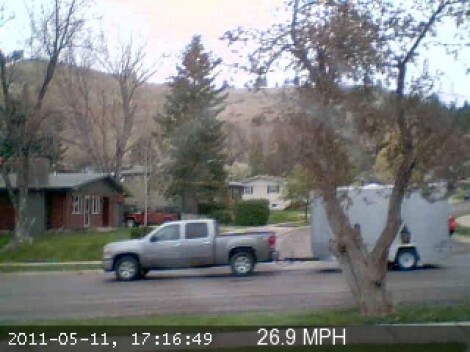 Well, he’s really keeping a webcam out for speeders. His technique doesn’t use radar or lasers. He’s processing webcam frames in Python to calculate speed. It comes down to some basic image manipulation. He firsts gathers the images necessary to make the calculations by using a motion-detecting webcam program called YawCam. The images are analyzed to establish which parts have changed between frames; this gets rid of all the stationary objects. Now the frames can be compared to establish the distance in pixels. By calibrating the shot through measurements of the target area, this data can be directly converted into actual distance. It is then compared with the timestamps from each frame to arrive at speed. This can be used for vehicles on the street like we see above, or more whimsical measurements like pet turtle progress. [Diego] wrote in to let us know about the haptic feedback arm project with which he’s hard at work. He calls it the Vimphin, which is uses the beginning letters from the words: Virtual Manipulator Physical Interface. 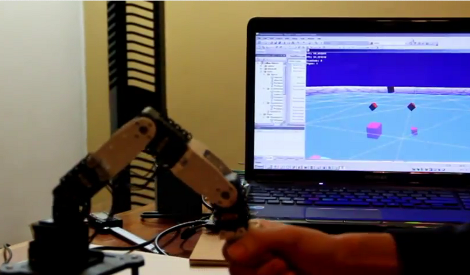 Instead of a claw, the robot arm has a hand grip that lets you easily move it around. That is unless the virtual model of the arm encounters a dense substance, and then it’s going to be more difficult to move. The test arm seen above includes several high quality robotic servo motors. You probably know that servo motors have feedback circuits that let them sense their position, and this is what is used to detect when a user moves the arm. This movement is tracked in the virtual 3D environment seen on the screen. In this case, the base of the robot is sitting in a pool of water. When the end of the virtual arm is in open air it’s pretty easy to move. When it dips below the water line the motors are used to increase resistance, simulating movement through a denser substance. This sounds like a great piece of hardware to have around when the OASIS is finally developed. All grain brewing is a labor and equipment intensive endeavor, but it produces the highest quality beer compared to partial mash or extract brewing. [Jeff Karpinski] started out with the latter two methods, but as his enthusiasm for the hobby mounted he found himself brewing all-grain batches with just an electric kettle. He developed the system seen above as an easy method of automating the all grain process, and he managed to make it tidy enough to do in the kitchen. All-grain brewing usually involves five or ten gallon (or more) boils. This type of volume is usually what demands that the brewing process move out of the kitchen. 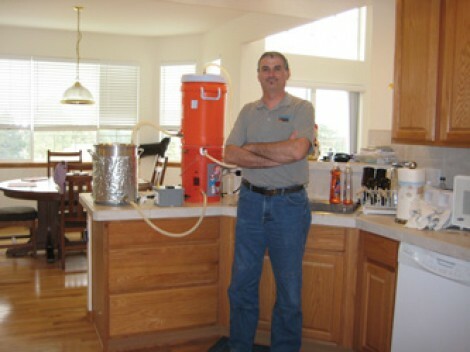 But since [Jeff] is the only beer drinker in the house he limits his sessions to three gallons. This means all of the equipment takes up less room. Here he’s got a five-gallon bucket, cooler, and brew kettle on just one small piece of the counter. In between the kettle and bucket you can see the controller box he built. This is responsible for switching power to the heating element in the brew kettle, and the electric pump in the bucket. The bucket has a permanent counterflow chiller which brings the wort down to a suitable temperature before pitching the yeast. It’s pretty amazing how well contained the liquid is from start to finish! So let’s say that you’re a developer on the Xbee team. You need to test the extremes of what the RF radio modules can do when in a large network. But in addition to numerous nodes, you also need to test the effects of distance on the radios. Since it’s not reasonable to distribute hundreds of the devices (each with their own power source) throughout town, you build a test setup like the 1 kilonode Xbee rig which the project manager, [Jared Hofhiens] is showing off. He’s holding one blade from the rack-mounted system. Each of those squares is an Xbee module, there’s 32 etched onto the board. On the edge furthest from him there are a set of connectors which mate with the rack connectors, hooking the blade up to a set of terminal servers. 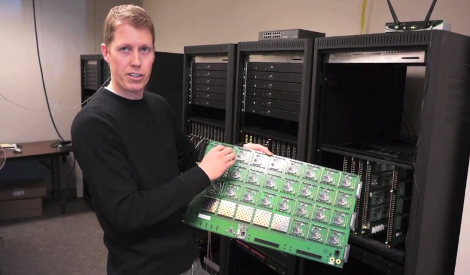 These servers allow developers to ssh into individual modules. On the near side of the blade there’s a set of attenuation adjustment circuits. They allow adjustments of 0-40 dB of attenuation in 10 dB increments to adjust how strong the RF signals are, simulating distance between modules.